It is ten thirty at night at the end of a stormy, rainy cold day somewhere in the remote wilderness of Iceland. We are still quite a distance from our refuge for that night when the short Icelandic night draws in. Suddenly our Land Rover support vehicle’s axle breaks, we stop just in time before the left rear wheel completely falls off. This was one of those times when we were extremely thankful that there is a cell phone signal almost everywhere on this 103,000 sq. km island, and so we were able to call the refuge keeper to come to our rescue. Magne our support driver had to brave this hostile environment solo all night and wait for spare parts to come the following morning so that he could repair the Land Rover. 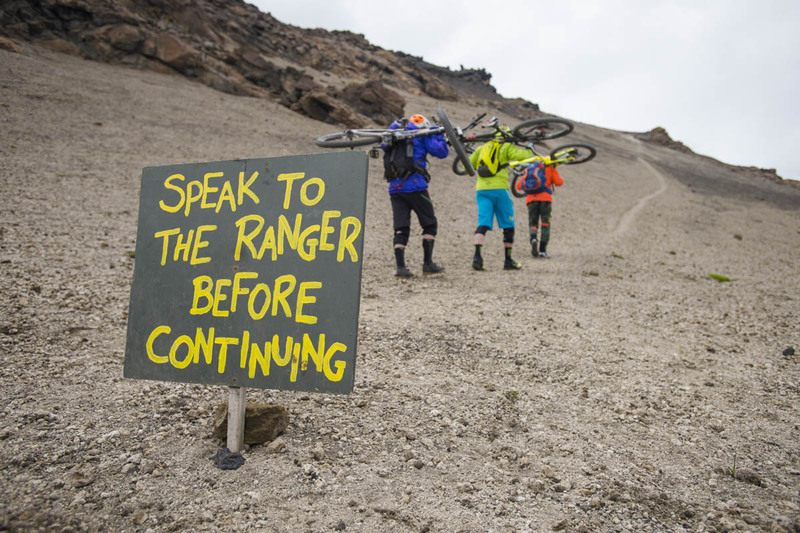 As they say; an adventure isn’t an adventure until things start to go wrong. 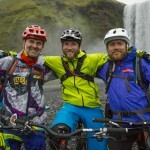 The following day downhill legend Steve Peat and I continued our North to South traverse of Iceland on mountain bikes, knowing that Magne would catch up with us at some point that night at the camp site. 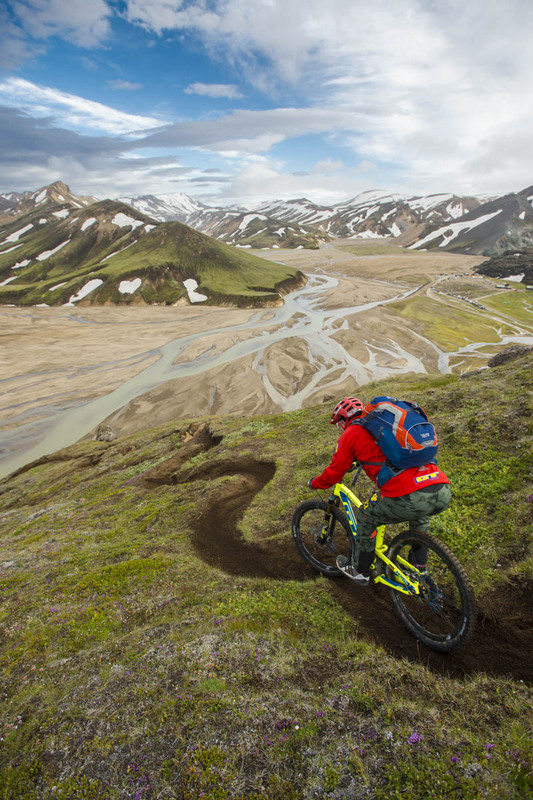 I’ve been wanting to do a mountain bike trip to Iceland for nearly 20 years, unlike the bike-packers or touring-bikers who frequently ride this volcanic island on the main roads and dirt roads, we wanted to hit the best single-track, while crossing through the barren, isolated and little visited interior. 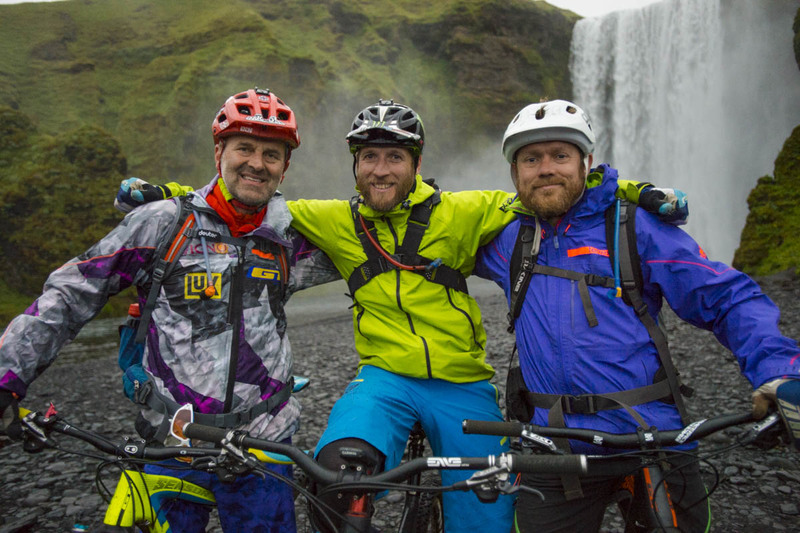 Runar Omarsson was our local contact, an Icelandic mountain biker and entrepreneur whom I met a few years ago and who loved the idea of this adventure and riding with a couple of his two-wheeled heroes. 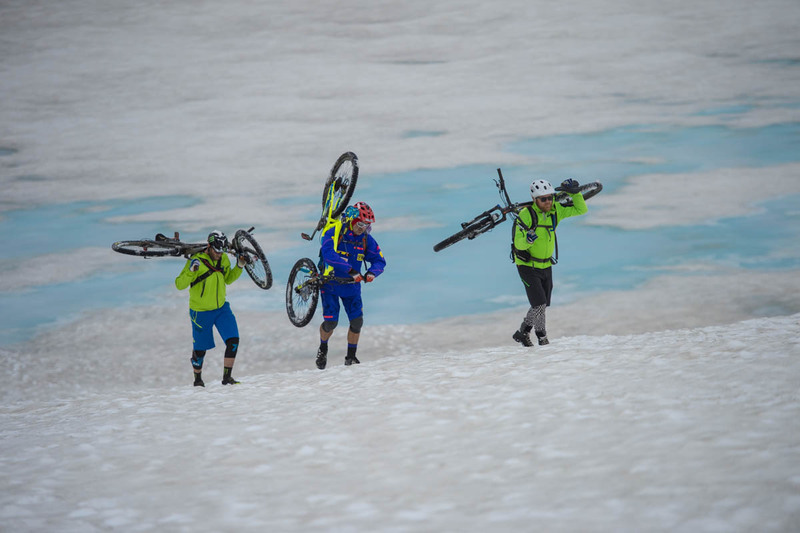 We came up with a plan, route and a support vehicle with an off-road trailer with gargantuan 36” tires to conquer the deep rivers, snowfields and sandy sections along the way. 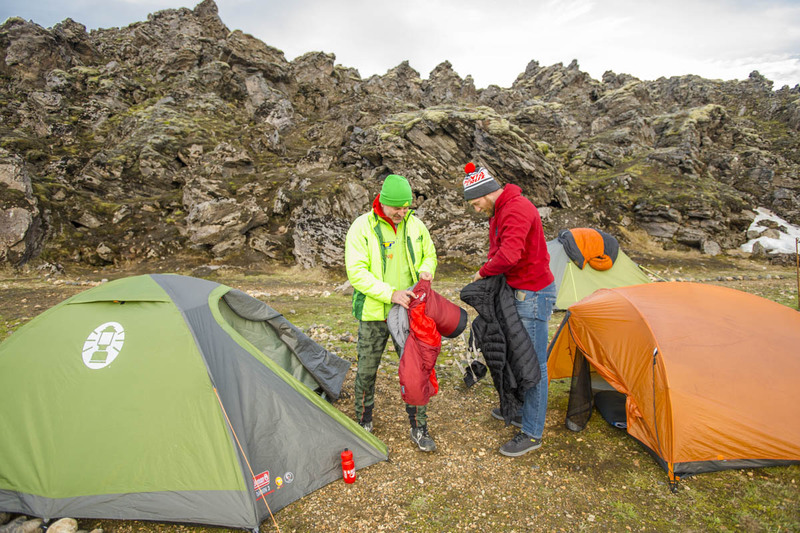 Magne from Icebike Adventures looked after the logistics and made sure we could travel light with day-packs only; we didn’t have to worry about food, tents, sleeping bags or our film makers extra equipment. 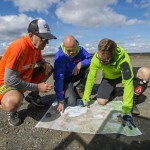 I was very excited to have Scott Markewitz one of the most accomplished bike and outdoor sports photographers with us to capture our trip in photos and Cedric Tassan (VTOPO) to film our feats for an upcoming global TV documentary. 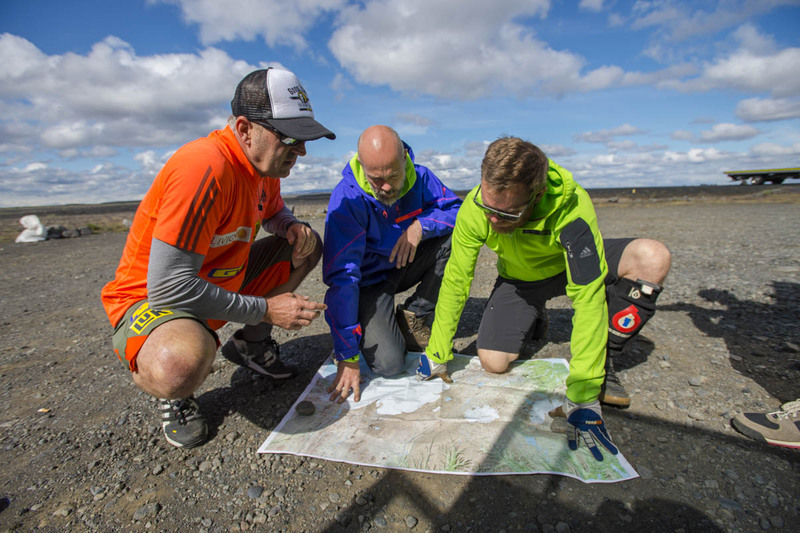 Our international team met at Reykjavik before continuing on a with a domestic flight to Akureyri where we met up with our local crew and began our adventure by driving – east to latitude 66 the Arctic Circle. 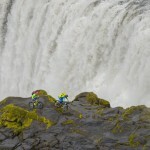 Our first stage started near the coastline with a stunning ride to Dettifoss waterfalls. We clocked about 50km that day and due to a late start we didn’t finish until nearly midnight, and all without lights, simply powered by the midnight sun. This time of year it hardly gets dark in Iceland. 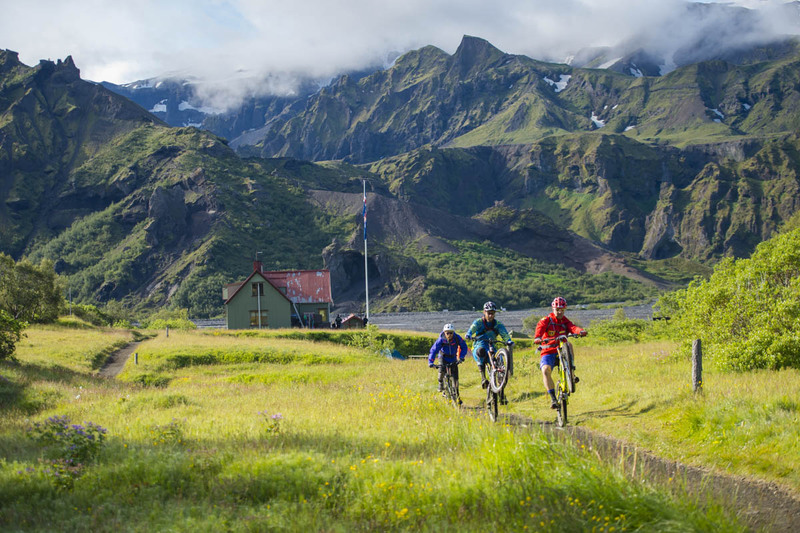 During the ride I had quite a surreal moment when we had the midnight sun to the west, the arctic circle to the immediate north, a blue moon in the east and to our south the fabled trolls and elves territory. The Jökulsarglufur trail that followed the river had a nice natural flow, of which kind we anticipated experiencing a lot more of in the forthcoming days. There were a few smaller river crossings to tackle , easy enough to take off the shoes and keep them dry for the time being. The last several miles during the twilight hours was very rocky and technical and the dimming light made it more challenging. At this point our group split up since everybody was keen to make it back to camp since darkness had set in and we were famished and fatigued. The highlight was without a doubt was witnessing the massive amounts of water that gushed over the ledge of Dettifoss waterfall (a volume of 500 cubic metres per second). I was stoked to have my old friend and former adventure partner (Borneo, Ireland, Scotland) Steve Peat along. Due to an ACL injury earlier this year, he missed the 2015 downhill racing season and had recovered just enough from his surgery to join me on this epic. 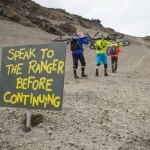 It is always a good laugh when you have Steve Peat along. Our entrance to the Highlands was marked with powerful head winds, off road tracks and river crossings. To be precise, this was the Askja area. Word had it that the snow conditions were still very bad in the mountains and so far it had been Iceland’s coldest summer for the past 50 years. Despite their names, Iceland is not ice it is green and Greenland is not green, it is ice. But this year our expected green island was somewhat icy. We were expecting some snow but not as much as we were told would be ahead of us by the ranger in Drekagil. 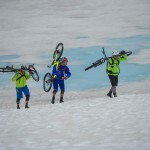 He said that so far this season nobody had crossed the only pass between the north and south, not even hikers and that we would face about a 60km stretch of snow, pushing and carrying our bikes. Not ideal for anybody, especially a guy who just had ACL surgery. The decision was hard, but after hiking up to the snowline we saw first hand that we couldn’t do it. The only option we had was to radio our support vehicle, asking him to fetch us. Magne was already driving the long 250 km detour to get to the other side, since the only direct route was impassable by jeep. As it turned out, this was a wise decision because the following day the weather turned nasty. However we were extremely disappointed, so there was nothing for it, but to drown our sorrows with a bottle of Scotland’s finest…some whisky. The setting was pretty perfect,, we were sitting and soaking our muscles in a hot lava heated river. It was amazing to the see the sulphur fumes still rising from the lava fields after the most recent volcanic eruption last year. The black volcanic magna rock was sharp and fragile and the water that flowed underneath was hot. Unexpected pockets open up and close as nature dictates, we were lucky enough to find such a spot and soak our sore muscles in it at about 42 degrees Celsius. After being crammed into the Land Rover for the better half of the next day, we continued our ride on the other side of the snow pass. The weather was miserable and we had a long way to pedal along the boring Sprengisameur Road before reaching the more scenic southern part. Despite our super functional clothes we couldn’t avoid getting wet and cold; sometimes submerging waist deep in water or fighting rain and headwinds. We kept moving forward trying to stay on schedule for our 6 day traverse, by when we wanted to get to Skogarfoss waterfall, Iceland’s tallest at 60 meters, close to the southern coastline. 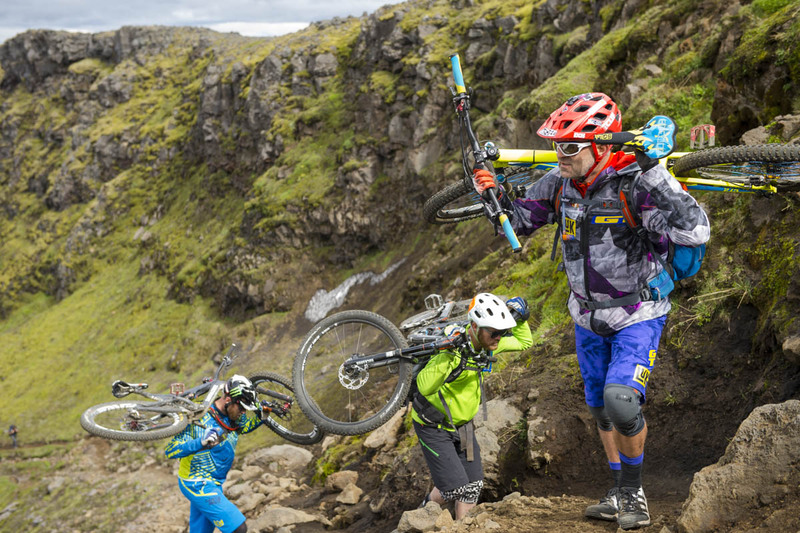 Most mountain bikers in Iceland do day trips, to do a multi day trip one has to be prepared and it would be extremely tough and rough to do so without some sort of support. It was a good sight to see at the end of such a day to see our support vehicle with a dry set of riding gear waiting for us. The following morning the sun came back out and the landscape looked more and more amazing, flanked by glaciers, colorful ridges, giant river deltas and lava fields; and twisting through the midst of this scenery was some stunning natural single-trail. The trails looked like they were carved by Thor especially for mountain bikers, the traction on the volcanic soil was not from this planet. 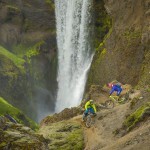 It was so much fun riding with Runar and following Peaty’s lines downhill, as long as I could hang with him. I’ve been fortunate enough to ride with many of the world’s best bike riders, it is always cool to see their creative lines and styles. We all choose all mountain bikes for this trip, Peaty brought his Santa Cruz 5010 model with 125mm travels, Runar and myself both rode GT Carbon Sensor bikes with 130mm/160mm . Along the Landmannalaugar trek we started to see more backpackers and even the odd bike rider. The lands reminded of Game of Thrones and Lord of the Rings type of films. We set up our tents at a beautiful campsite. Good thing the days are long during Icelands short summer months, we needed all the time and light between the distances we had to cover and the extra time it took for filming and shooting photos. One location more stunning than the next. Before falling asleep we had to give our bikes some attention, the many water-crossing and volcanic sand started to take its toll on our equipment; and I’m still not sure how good sulphur stream water is for bearings and bushings. Day 5 continued as the previous day had ended, incredible scenery and views as far as the eye can see, including glances of Europe’s biggest glacier, Vatnajökull. 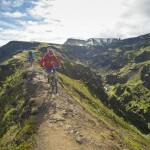 Laugavegur Trail, actually just became a IMBA Epic Trail, we crossed lots of lava fields and deserts. The black sand and soil was a stark contrast to the lush green ridges and rugged mountains that look just like the Napali Coast on Hawaii but without glaciers and snowfields. 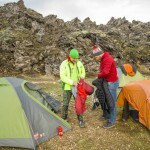 The Laugavegur trail brought us to another picture perfect campsite at Thorsmörk. Not only here, but actually in every household in Iceland, hotwater and heating comes straight from the ground and therefore smells like rotten eggs. The last day turned out to be the longest but also the most amazing, again we had to cross several miles of snow fields, but before we climbed on gorgeous ridges above canyons, some of them scarily narrow with deadly consequences should one make a mistake. 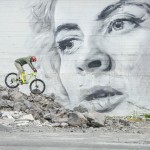 This caused some stressful riding and required nerves of steel and incredible balance. This day offered pretty much everything Iceland has to offer, we had to do a lot of climbing, pushing and hiking including approximately 6 km of snowfields; at one point I felt like I was on an arctic expedition, I guess that thought was not that far out of place. Most of the time the snow was too soft to ride it. 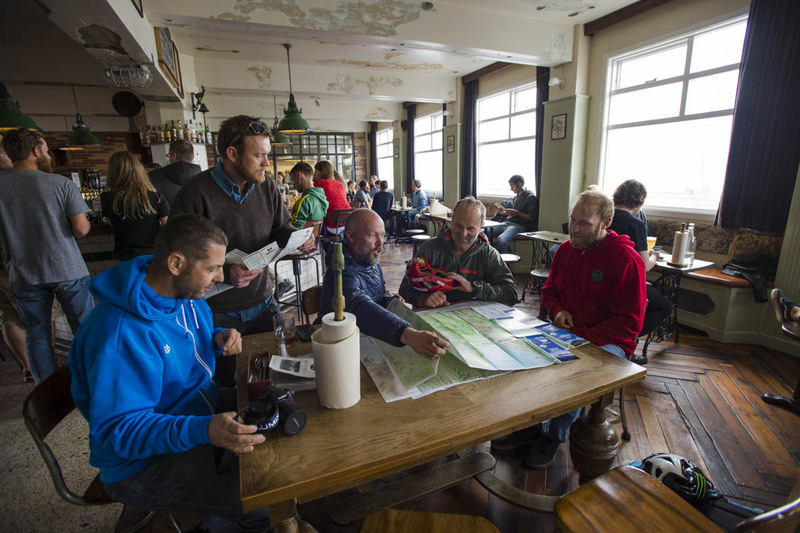 Runar proved to be a valuable asset to our team, he had lots of local knowledge and even showed us some of their secret trails, after making us swear secrecy first. 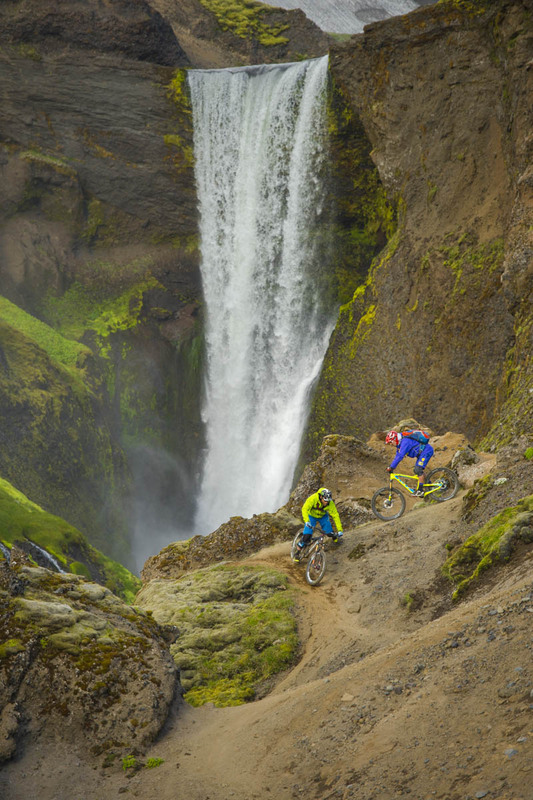 I have never seen as many big and powerful waterfalls than on the final descent on the Fimmvörduhals route, endless trail, sometimes rough and rocky at other times smooth and fast. 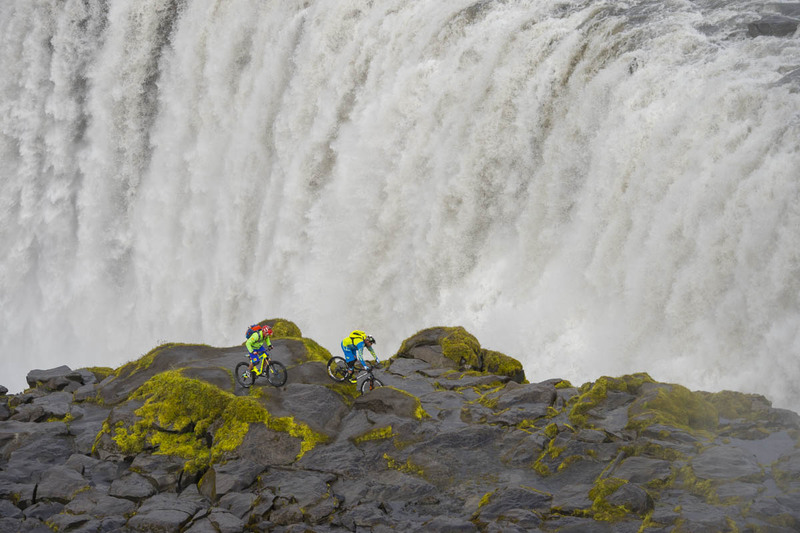 By the time we got to Skogarfoss waterfall, it was almost dark; we didn’t even take our helmets and backpacks off before indulging in food on the hood of our Land Rover. Mission accomplished, another bucket list trip checked off my list. Thanks so much to Adidas Outdoor, Monster Energy, Clif Bar and Santa Cruz for making this trip possible. Thanks also to our “Sliceland” team for their hard work and dedication, their film and photos have captured some of our memories forever. 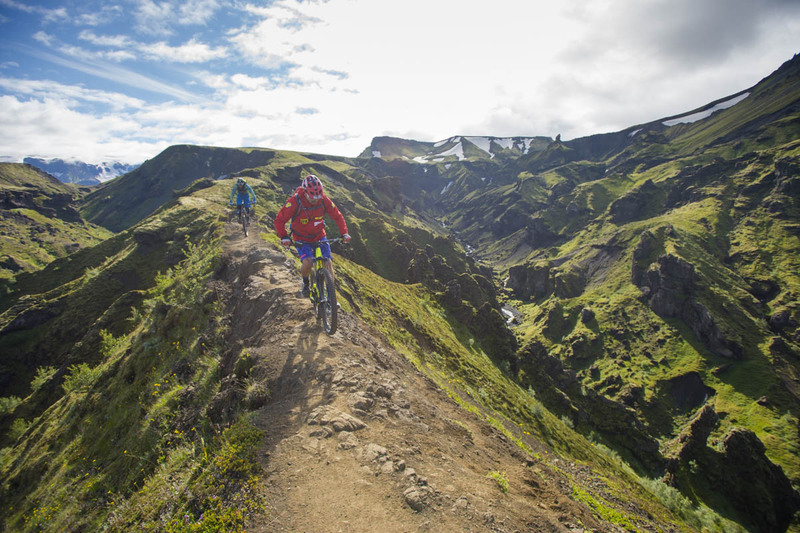 Appeal: Please only ride on designated trails while exploring Iceland on a mountain bike. Steve Peat, born and raised in Sheffield England, with 2 older brothers who kept him on his toes and very competitive when younger!! Became Mountain bike Downhill World champion in 2009 and has 17 World Cup victories to his name, among many other prolific results. 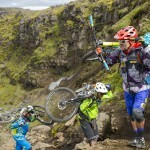 He rides for the Santacruz Syndicate and has been Britons top guy for over 2 decades. His work with younger riders and charities has been a huge part of his career and to this day he still runs the Steve Peat Syndicate, bringing riders on in there chosen disciplines. He is also a big family man and has 2 young boys to follow in his footsteps. Hans Rey was born in Germany in 1966, this Swiss/American national now resides in Laguna Beach, California with his wife Carmen. 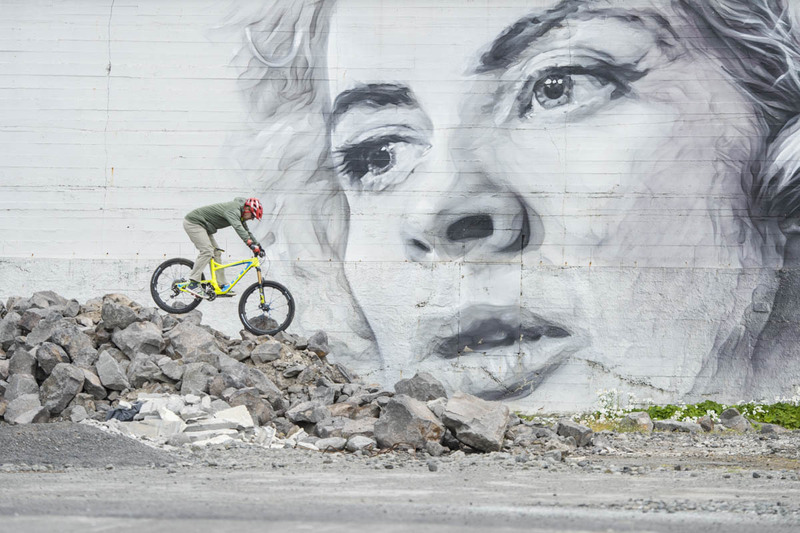 Hans is a former Trials World Champion and inductee of the Mountain Bike Hall of Fame, he is widely considered to be a pioneer of both the Mountain Bike Freeride movement and the Trials riding scene. As a professional rider and ambassador for the sport he continues to travel the world having so far visited seventy different countries. 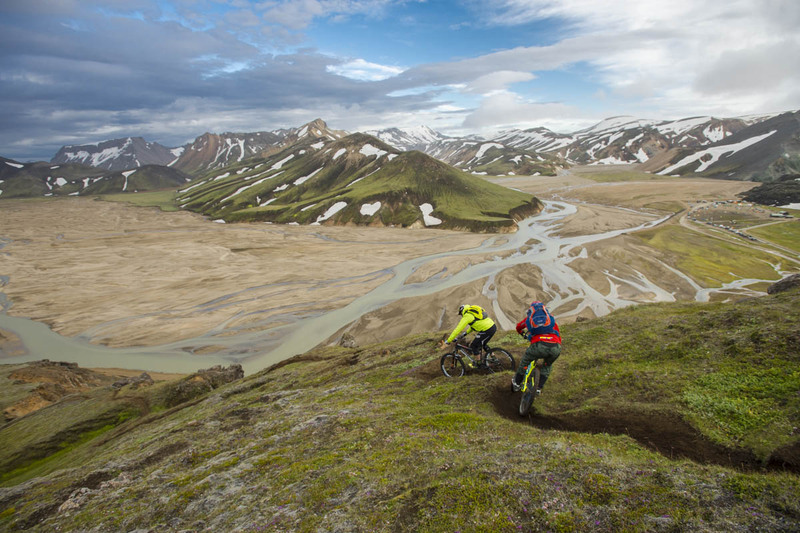 During the mid nineteen nineties, Hans created the Hans Rey Adventure Team visiting remote and extreme locations around the globe, often riding his bike where a bicycle had never been ridden before. In addition Hans would seek out locations that were both historic and held some mystery, always capturing his exploits for the media. In 2005 Hans started a non-profit charity called Wheels 4 Life, giving bicycles to people most in need of transportation in developing countries. 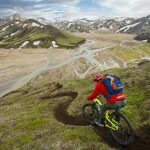 Currently he is working with IMBA to develop more beginner friendly flow trails, like this Flow Country Trails idea. 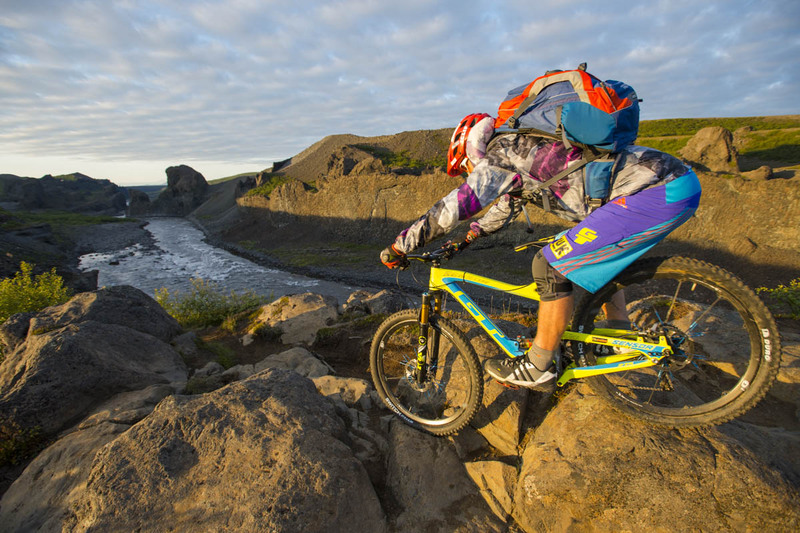 Rey has been a pro mountain biker for nearly 30 years! 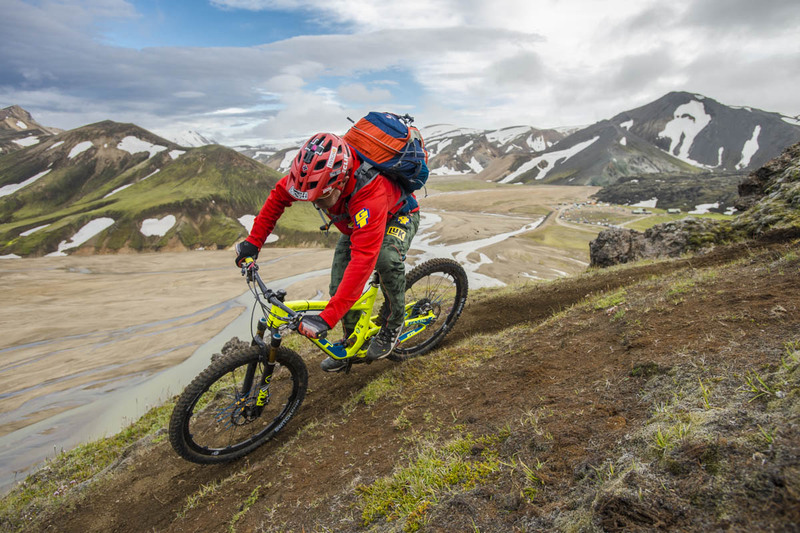 His sponsors are: GT Bicycles, Adidas Outdoor, Livigno Bike Resort, LUK Automotive Systems, Crank Brothers, Fox Shox, iXS protection, Clif Bars, SQ Lab saddles, Deuter backpacks, Shimano, Muc-Off care products and Adidas Eyewear.